This month will mark the sixth anniversary of the current economic cycle in the United States. Although it might be too early for an obituary –the chances of a recession by year-end are slim— a mid-life review of the expansion is surely due. The story, I warn you, may strike you as uninspiring: “The 21st century economy: A solid slacker” would make a fitting title. Most people hold the notion that expansions are times of normal or fast growth. A few economists would say that they are periods when the primary factor limiting how much the economy produces is its physical capabilities --how many people are willing to work, the quality of their skills and technology, and the physical capital available for them to use. (Read this blog post by professor James Hamilton on Econbrowser.) On the flip side, a recession is an episode of slow or no growth, and slack capacity. By historical standards, the economy has been in a grey area between recession and “normal times” since 2001. Exhibit number one: The Labor Participation Rate –the ratio of employed people to the potential labor force— is low and out of course. Normally, the rate goes up during times of expansion as better job prospects entice students to get a job, fifty- and sixty-somethings are kept in the payrolls until their normal retirement age, and stay-at-home mommies and daddies find it harder to pass up job opportunities. This time around, however, more and more people have stayed away from the labor market throughout the recovery and the expansion (chart 1). 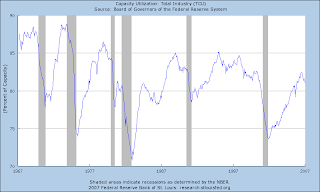 Exhibit number two: Total Capacity Utilization –a ratio of actual to potential production in the industrial sector– has recovered all the ground that it lost during the 2001 recession, but it has failed to increase after that (chart 2). At one point or another during each of the three previous expansions, capacity utilization topped the 85 percent mark; now, after 23 quarters of expansion, it hovers around 81-82 percent. Exhibit number three: For too long has the Gross Domestic Product (GDP) stayed below its potential, defined as the maximum level of output the economy can produce without increasing inflation. The output gap has stayed between one and two percent, instead of falling to zero and beyond, as it always has done in the past (chart 3). Since the three statistics discussed reflect the same reality, I have taken the liberty of merging them into a single indicator. 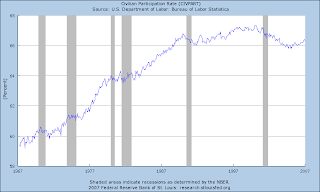 The Slack Index, as I have called the cocktail, is the average of the output gap, unused industrial capacity (100 minus Total Capacity Utilization), and the non-participation rate (100 minus the Labor Participation Rate). I normalize the series to be equal to 100 in 1992. A higher value of the index indicates more spare productive capacity. The index has remained for quite some time around a value of 96, which would be fine for a recovering economy, but too high for an expanding one (chart 4). Turning to evidence on growth, GDP has averaged an annualized growth rate of 2.8 percent, lower than in any other expansion in the post-war era. For example, in the 23 quarters following the 1991 recession, the average growth rate was 3.3 percent, and 4.9 percent in the same period after the 1981-82 recession. It seems pretty clear that the economy is unusually far below its possibility frontier. The good news is that if we are able to shake off the threats from the housing slump, the sub-prime mortgage crisis, and soaring oil prices, the economy should be able to grow much faster without stoking inflation. The job market appears to be tight. The unemployment rate, at 4.7 percent, remains low. But this time around we have a large pool of potential workers who so far have chosen to stay off the payrolls. If the macroeconomic threats evaporate, those people may return to the market, increasing the supply of labor and pushing wages down. So if the economy comes out of the slums and you’re looking for a job you’d better not play hard-to-get; if you already have one, don’t bug your boss to cut you some slack.